Unfortunately, we talked of Columbine in our Psych rotation yesterday. And a theme we agreed was an excessive use of labeling during the aftermath. Kids all over the country who are bullied and withdrawn and a little eccentric were eyed suspicously, and their already tourtured exsistance made worse. I agree, there's no doubt this will happen with the mentally ill. We (and our lovely media) want to lay blame somewhere, instead of coming to the realization that we can either do more to help the people who need it, or accept that we don't have crystal balls to predict the future. I was thinking of you -- and how you'd respond -- when I posted this afternoon on this. What bothers me -- deeply bothers me -- is that people knew this young man was extremely troubled. They complained. They notified. The police were notified. Campus security had to remove him from a poetry class. A professor referred him for counseling. A roommate got him taken to a mental health center. And -- it would appear -- with the possible exception of a prescription for antidepressants -- he got no help. Maybe he refused. Maybe he had a right to refuse treatment. Maybe he should have a right to refuse treatment -- but shouldn't Virginia Tech have had the right to expel him? Or at least condition his continued enrollment on his seeking help? He may not have made specific threats -- but he was scaring people around him. That has to mean something. You pose an excellent question: "The question is where do we draw the line when deciding how to protect the rights of people who just think that they are God while locking up those who have a God like desire to decide who shall live and who shall die." I said in my post this afternoon I have no answers, only questions. But there was plenty of notice; there was time to act. And nobody did... and then Cho acted. It's not right. Thank you for expressing some of the very thoughts and concerns I had about this man and his mental illness. Unfortuantely, he now gives all of us who suffer from mental illness more to have to work against. The misconceptions, the fear, the mistrust. It will take a long time before the damage to the mental health community can be repaired. And so much more time for healing from the damage to the shattered lives of those who lost loved ones in these shootings. Excellent post MJ. I agree completely with your assessment. As usual, MJ, a very eloquent and poignant post. Thank you for your insight. I also thought about how Asian students would also be looked at with suspicion for a while...similar to after 9/11 and middle eastern people. Granted I am a mental myself...but if this can cause anyone to look at me with caution/fear and thus to tread carefully around me, this is a silver lining for me. I experience condesending attitudes and being treated as a second class citizen all the time due to my mental illness. I will take any "respect" I can get. So many times I just want to be left alone and this might work for a while. I am horrified at this...don't get me wrong. In fact, my paranoia is on the rise and I have to fight to make myself leave the house the past two days. I cannot imagine the grief the families feel. Let me bring something up here...this young man--human being--was hurting beyond belief. And he is referred to counseling. First, counseling on a campus is not geared for problems this deep. He would have been referred out for heavy duty treatment. Let me ask a pointed question...did he have medical insurance? Medical insurance that will actually PAY for such treatment? God forbid if he was in a HMO...so if the HMO prevented him from getting the help he needed or if his insurance did not cover it...we all know he would not have been able to afford it. In my part of the country, hospitalization in a psych unit is no longer allowed by the insurance companies...you can be admitted for a few days so you can be drugged up but then you must be discharged and treated on an outpatient basis. Read between the lines here!! Who is making sure he is even taking his meds?? I'm willing to bet the farm that insurance and paying for treatment had a role in this. But I also bet you that if that is the case it will never come to light in the media. The comments here are very interesting because this story really does bring up so many questions and issues---that of stereotypes, civil rights of the mentally ill, a school's right to check out their students' mental health, insurance issues, etc. It's mind-boggling. While I feel an aching hurt for the families of the victims, and the students at VA, I also can't help but feel sorrow for such a lost, lonely and pain filled soul as well. Excellent post MJ. You brought up some very important points re: this subject. The media is labeling this young man basically as "evil" pushing him(and his illness) into further isolation, negating any responsibility society has to protect and advocate for our most vulnerable, in addition to protecting the public. You are correct, there is a fine line and many ethical issues to consider regarding mental illness and civil liberties, and where do we begin? This is truly a tragedy, in the worst way. I was criticized in an online forum I participate in for suggesting that more proactive and assertive measures should have been taken with this young man. Did HIPPA and fear of offending his civil rights cause administration to shut down those professors who rose the big questions of him posting a danger to self and others? While the crime he committed is horrendous, and the 32 lives he took unthinkable, I too, grieve for the man behind the face that creeped people out. I grieve for his parents, living with the shame of what their son did and their lost dreams. I've seen much discussion about gun control arise out of this tragedy. Let's talk about mental health treatment - funding for it, acceptance of it, and how we can improve it overall. How do you differentiate between someone who suffers from a mental illness and someone who's adolescent experiences have led him to believe that people are cruel, indifferent, and must be punished? I have thought about this as well... this tragedy really hit home. 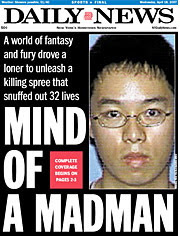 This man was mentally ill. He was sick. People saw the warning signs but they are just that.. warning signs. You can't lock someone up because you think maybe they have a mental illness. You can't rob someone of their civil rights because of fears that they are "weird." Many kids in college are seeking psych help whether it be for stress, depression, anxiety or a variety of other reasons. Mental health records similar to other health records are confidential. Do people really want individuals to be banned from academia because at one point in their lives they were "locked up." What about that kid in high school who was a bit overwhelmed and was admitted for overnight observation. Should that determine whether or not she/he should be allowed in college? No. You can't prevent an 18 yr old with a history of cancer from going to college... you can't prevent someone with a mental health history from going. I am appalled that some are even suggesting that. The more stigma that arises with mental illness the less people who will seek out help and not seeking help is a bigger concern in my opinion. I have a mental illness myself (bipolar 2) but it bothers me how many people want to blame mental illness for what he did. Of course he was ill-very ill. But one can be ill AND evil at the same time. He obviously let hate consume him at a very deep level. You can't blame this all on illness. This type of tragedy would be much more common if one could. How many more people with mental illness and with high (moderate? some?) risk for violence do we institutionalize to prevent one tragedy like this? 10? 100? 1000? We, as a society, have some tough choices to consider. We already have a shortage of inpatient beds and community resources -- this will only tax us more. And then what do you do? how long do they stay in a controlled setting? A week? A month? A year? What happens now is, as soon as they say they are safe, and appear to be so, they are discharged outpatient. But many states do not have outpatient commitment laws, so nothing can be done to help keep people in treatment. In Maryland, we just had an Attorney General interpretation come down (Kelly vs DHMH) that prevents forced treatment of inpatients with mental illness if they do not show any dangerousness in the hospital. That's right. If someone like Cho were admitted, but showed no dangerousness inside the facility, we would be powerless to treat him. After the man who got shock on the plane because he was Bipolar, I was very upset. Plus around that same time there was another man who was bipolar and schitzo who jumped out of the plane before take off. The one that was shot really disturbed me because the agent could have just punched him or used his karate skills. Also the woman next to him, I think it was his wife was saying that he forgot to take his meds. I'd say someone shouldnt forget to take their meds on the day they'll be on a plane. But I still feel it was the fault of the agent who shot him.